We need a new word for videogames. The term was coined back in the 1970s to describe something that at the time was a completely new and revolutionary artform (it must be barely conceivable to today's gamers that there was a time in living memory when such things as games played on a TV screen simply didn't exist), and the image it conjured up was a straightforward one of Asteroids, Pac-Man and Space Invaders - that is, an abstract, magical and ultra-modern type of entertainment, born in technology and totally unrelated to any kind of leisure pursuit that had ever gone before it. The very word "videogame" inherently depicted something exciting, glamorous and - because most games were located in arcades, places where under-18s weren't allowed - slightly forbidden and dangerous too. I died 0.2 seconds after taking this screenshot. FOR YOU. 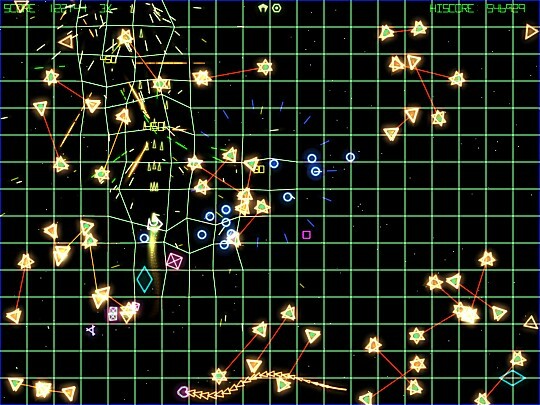 Grid Wars 2, by Mark Incitti, is a freeware game for PC and Mac. It is, as the alert viewers of WoS will instantly recognise, not unlike Geometry Wars, the secret bonus game concealed within Project Gotham Racing 2 for the Xbox. 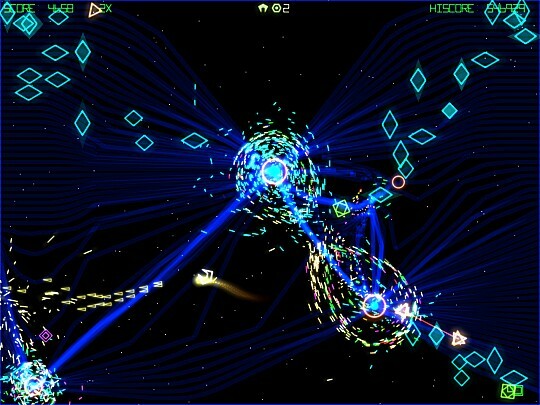 (Or to be strictly accurate, not unlike its sequel, Geometry Wars: Retro Evolved, which runs on the Xbox 360 and is the flagship title of the machine's online service, Xbox Live Arcade.) In itself that'd be passingly interesting - particularly for anyone who didn't want to fork out £300 for a state-of-the-art, all-singing, all-dancing Xbox 360 in order to play a vector-graphics Robotron game - but while GW2 is undeniably closely related to GW:RE, it's the ways in which it's different that make it remarkable. Remarkable, in fact, to the extent that it's possibly the single most perfect piece of pure videogame design that this reporter has seen in the last decade. The defining characteristic of all good game design - not just videogames - is the marriage between accessibility and depth. If you can create a game that anyone can pick up, understand and start playing in seconds without having to even glance at an instruction manual, yet which players will still be organically learning the subtleties of, and developing new tactics and strategies for, hours and days and weeks later, then you're a great designer. Any idiot can do one of the two, and even experienced authors who seem to understand the skill of combining both can get it spectacularly right, and then catastrophically wrong, in two almost identical circumstances. But GW2 creator Mark Incitti has taken a game that was already very delicately balanced, added and changed elements that fundamentally alter the nature of the gameplay, and still come up with something that recognisably possesses the character of its parent yet is a vastly - almost immeasurably - different, and superior, game. And if we're going to try to understand how such a feat can be achieved, we're going to have to examine both why Geometry Wars is good, and why Grid Wars 2 is so much better. If you remember Starstrike 2 on the Speccy, you'll feel at home in this shot. 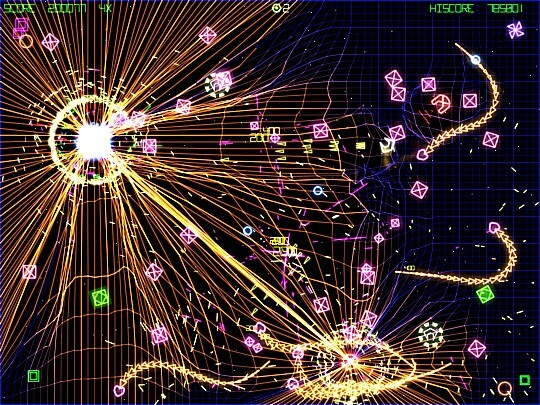 The original Geometry Wars and its largely-the-same 360 follow-up are both obvious and unashamed descendants of Eugene Jarvis' legendary coin-op Robotron. 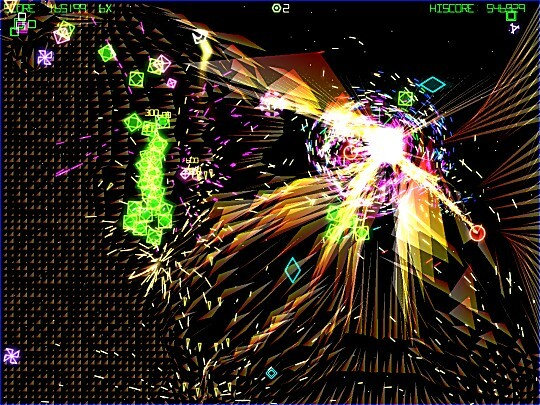 In all three games, the player is placed in a single static screen and then assailed by hordes of enemies from a small cast list, each exhibiting very distinct behavioural characteristics. Some track the player slowly but relentlessly, some are fast, some try to avoid his fire, and so on. 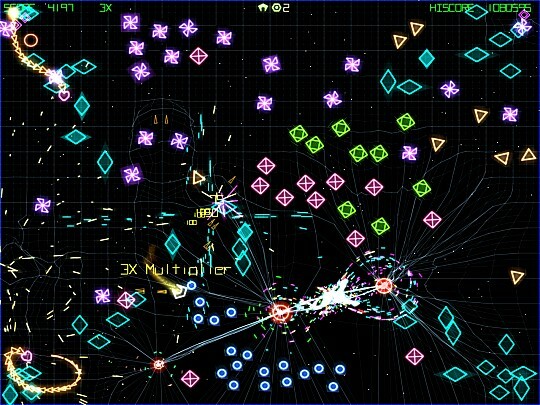 Geometry Wars actually simplifies the already-stripped-down mechanics of Robotron, reducing the number of gameplay elements and removing the "levels" structure, replacing it with a single continuous assault. To compensate, it racks up the speed, negating much of the tactical play that can be employed in the arcade game in favour of a pure reaction and co-ordination test. 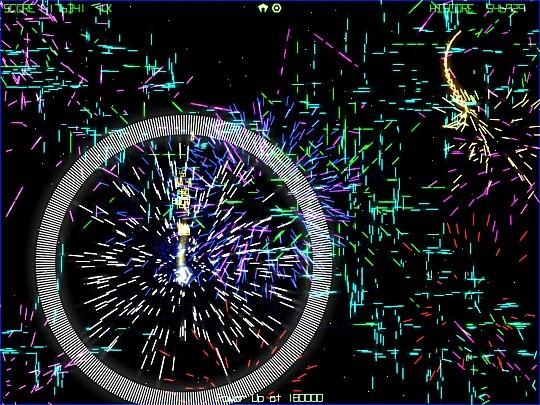 The major innovation of Geometry Wars, though, is the introduction of black holes. From time to time, unassuming-looking red circles appear on the GW playfield. They neither move nor shoot, and if unmolested present no danger to the player except one of careless collision should you not be looking where you're going. However, if disturbed by a stray bullet or an enemy bumping into them, the black holes will spring to life. Exerting an initially very weak gravitational pull, they draw enemies into their core, causing the hole to expand and spin and its gravity to increase, dragging in more and more enemies. 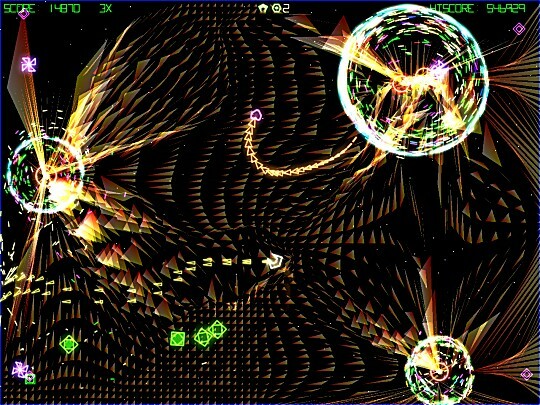 If the growth is unchecked by the player shooting bullets into it, eventually the black hole reaches critical mass and explodes, spewing out a horde of tiny enemies which spiral towards the player at high speed, normally resulting in his swift demise. In the Geometry Wars games, that's pretty much all there is to it. In Grid Wars 2, though, it's only the beginning. "Hey, cut out the damn choreography. This isn't bloody Riverdance." In GW2, y'see, despite all appearances you're not really a space warrior at all. What you are, in fact, is a farmer. The black holes are your fields, and the enemies are your sheep and cattle. If WoS was to write a "Have You Met Your Father?" feature on Grid Wars 2, its true ancestors wouldn't be Robotron and Geometry Wars, they'd be It's The Wooluf! and Command & Conquer, because this is really a game not about shooting space monsters, but about animal herding and resource management. It's fortunate, then, that your reporter is descended from a long line of shepherds, and is hence ideally suited to explain further. The black holes contain the key to racking up high scores in GW2. Blasting baddies nets you only a few tens of points, and while staying alive and avoiding using your screen-clearing smart bombs will build up a multiplier (the highest your correspondent has ever seen it get is 7x, and letting off a smart bomb scores zero points and resets the multiplier to 1x), it'll still take you forever to break a million points just by wiping out waves of bad guys. What you CAN do with them, however, is "bank" them by luring them into the black holes, and then blow up the black holes by repeatedly shooting them, which scores a LOT more points. The finer workings of exactly how many more still elude this reporter at the time of writing, but if you really stuff one of those little dark stars with evil beasties before you wipe it out, you can easily notch well over 100,000 points from a single supernova. To do this, however, you'll have to "farm" the hole - this is, lure a lot of enemies into it until it expands, shoot it back down to a more manageable size, then lure some more in until it expands again, then keep repeating the whole process until you daren't risk leaving it any longer and blow it to pieces. (Because if you lose a life or use a smart bomb, the black hole is destroyed, you don't get any points, and all your hard work will have been for nothing. You won't even have an EU subsidy to show for it.) And how do we farm a black hole, apart from "very carefully"? Well, that's when Grid Wars 2 starts to get really clever. "Hang on, I seem to have wandered into Gradius IV by mistake." If you've been paying attention so far, you'll have noticed the bit where we observed that the enemies in Geometry Wars "exhibit distinct behavioural characteristics". (And if you haven't been paying attention so far - ooh! Aren't the pictures pretty?) And while none of the enemies which appear in both games have had these characteristics significantly altered in GW2 (the only notable change is that the cluster of baddies generated by an exploding supernova now rushes straight at you instead of taking a looping path), the way their traits impact on the game relative to the "farming" principle has a whole new dimension. In the Xbox games there simply isn't time to plan ahead at anything other than the tactical level. (ie "How do I stay alive for the next three seconds?") But the slightly slower pace and different scoring system of Grid Wars 2 open up strategic possibilities which simply don't exist in Geometry Wars. By exploiting the various ways in which the baddies react to your actions, it's possible to deliberately and calculatedly cause them to spend most of their time not attacking you, but being dragged into black holes in their hundreds and getting helplessly trapped there until you destroy the holes for a big fat points bonanza.. Sometimes it's as simple as putting a hole between you and a pack of enemies (such as the dumb blue diamonds, which just head straight for you regardless of what might be in the way). Sometimes (eg with the green squares which run away from your shots) it's the slightly more sophisticated method of putting the enemies between the hole and your fire, driving them into the hole as they flee from the bullet stream. Sometimes it's desperately hovering at the edge of the black hole and shooting the enemies before they fall into it, because otherwise it'll be overwhelmed and explode before you have the chance to blow it up and get the points. And sometimes, most terrifyingly, it's sitting in the midst of a huge wave of deadly enemies on the edge of a whirling star of death and not shooting at all. Your frazzled and shredded reporter lets off a smart bomb in a moment of weakness. The latter scenario arises when you find yourself trapped on the same side of a large black hole as an onrushing pack of green baddies, with too much mayhem going on around you to get to the relative safety of the other side. The enemies are all being pulled into the hole, but if you shoot at them the force of your bullets' repulsion will actually overpower the hole's gravity, giving the enemies a fraction of a second in which to do what they really want to do, which is barrel head-first into you. 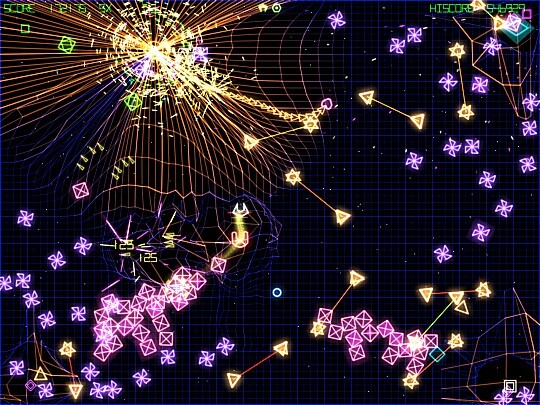 Or, if you're surrounded by the pink boxes with crosses in them, shooting them will cause them to break up into two smaller enemies which have a different, looping pattern of movement and are less susceptible to the hole's gravitational pull, again allowing them just enough leeway to suicidally ram your ship. Every fibre of your being is screaming out to pour laser death into the relentless attackers breathing right on your neck, or to unleash a smart bomb and release the unbearable tension, but you need to marshal nerves of steel and an iron will to fight the instinct and hold on in there to realise all the points you've worked so hard to earn. It's exhausting. The snakes are so lovely, and so passive, you feel a pang of guilt every time you shoot one. But even when you've mastered such demanding skills, all of this bitterly-won knowledge is still just tactical experience - short-term localised survival techniques. To play Grid Wars 2 strategically - that is, to intelligently maximise your scoring over the entire game rather than just stagger from emergency to emergency - you'll need to take account of the bigger picture. And for those of you still scratching your head from nine paragraphs ago and going "Hang on - Command & Conquer? ", that's where Grid Wars 2 reveals its true nature. It doesn't, after all, take too much of a mental leap to see what GW2 takes from a game like It's The Wooluf! The similarity of the shepherding principles, the indirect persuasion of enemies to go where you want them to, is plain enough. But Command & Conquer? 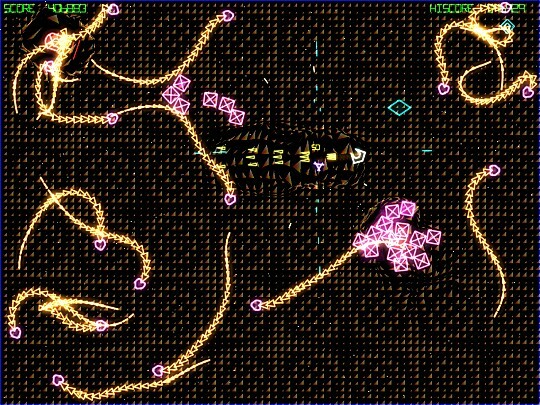 How could a frenzied Robotron-derived retro shoot-'em-up possibly share videogame DNA with a complex resource-managing real-time strategy wargame? Has WoS lost its mind? But there's no need to fear for your reporter's mental health, viewers. Because if you've got any kind of wits about you at all, it's easy to grasp why at heart GW2 and C&C are built from the same blueprint. 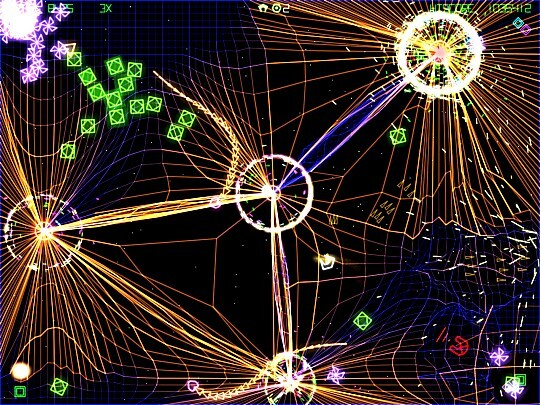 It might help if you think of the Grid Wars playfield as being a C&C campaign map viewed from an orbiting satellite, with the footage being viewed on fast-forward. This is real-time strategy all right, it's just that the "time" part is moving a little quicker than you're used to. And the resource management? Oh, come on, alert and perceptive viewers of WoS. Do we have to spell this whole thing out for you, or what? When black holes get big enough, they start to exert gravitational force on each other. Your resources in Grid Wars 2 are, of course, personified by the black holes. They're both the bases which serve as your primary line of defence (by drawing the enemies away from the mobile HQ represented by your ship and/or destroying them) and the factories which turn the game's raw materials (the baddies) into the desired end product (points). But just like in any good RTS, you have to manage them carefully - if you let too many black holes survive and grow, you risk losing control of the situation like a bad plate-spinning act in a circus, unable to react in time if one hole is suddenly overwhelmed by a wave of newly-generated baddies while you're dealing with one on the other side of the screen. And of course, exploding black holes unleash hideous swarms of particularly vicious enemies. If you destroy too many of the holes as they appear, though, you'll have no protection from the massive hordes of attackers that your guns alone aren't enough to cope with, and you also won't be able to take advantage of the huge points benefits they provide. You can score reasonably well in GW2 just by staying alive and killing stuff, but the mathematics of the game's difficulty progression means there's a glass ceiling through which you'll never break if you don't master the art of black-hole-farming. Man! What a pickle! Unchecked, they'll form double- and triple-star systems which are a nightmare to control. But this feature isn't meant to be a tips book. There are so many tricks and subtleties to playing Grid Wars 2 that we'd be here for a week if we started listing them all. The ramifications of the incredibly simple rules which govern the physics of how black holes act and move around the screen and link up and break apart could fill a whole chapter by itself, as could descriptions of the characteristics of the different enemies and how to exploit them. It's not even, ultimately, a piece just about how incredible Grid Wars 2 is. For that, we'd have to rant on for another few thousand words about all of its other wonderful features, like the unparalleled use of perfectly-balanced audio cues to give the player complete knowledge of what's happening onscreen without their ever having to take their eyes off the area around their ship; the endless range of control options, offering totally customisable joypad, mouse or keyboard controls (including 8-way digital PS1 joypad, if you're an old-skool purist like this reporter), shaming the lazy ineptitude of professional developers; the wealth of game configuration choices, providing for completely different kinds of game (this feature chiefly describes GW2 as played on a 1280x1024 playfield, but you can choose from 34 different sizes, for more arcadey or more strategic play as you prefer); the open-source coding, supporting easy-to-implement user mods for custom graphics, sound and gameplay; the beautifully simple and intuitive user interface... well, we could go on and on. The gang's (nearly) all here! What we're really here for, chums, is to appeal for clarity. Because something like Grid Wars 2 doesn't belong alongside TOCA Race Driver 3, or Fable, or Guild Wars. They have nothing in common except that they're all displayed on a screen, and you wouldn't call a letter from the Gas Board a "book" just because they were both made of words, would you? TOCA is a simulation. Fable is interactive fiction. Guild Wars is a virtual community. They all use the medium of electronic entertainment to reproduce some other type of activity in a more convenient or cheaper form, and hooray for them. Some people like that sort of thing. But Grid Wars 2 is a videogame. You couldn't do it on a board, or in a field, or on paper, or in a convention centre. It's a definitive example of an artform that didn't exist - couldn't have existed - before Pong, and it deserves to be recognised as such in its own right. If you care about the cultural perception and acceptance of gaming - and frankly this reporter doesn't give a monkey's nuts about that, but he DOES care about communication and language and universal understanding - you need to acknowledge that fact. With two precious extra lives floating around, use of a smart bomb here is justifiable. WoS apologises that this feature is a little all-over-the-place. It's part eulogy, part playing guide, part polemic and part random stream of consciousness. The fact is, in the week or so your correspondent's been playing Grid Wars 2, its abstract forms and events have been firing ideas and observations and thoughts into his head almost as much as they've been firing laser blasts at geometric shapes, and this feature can only brush fleetingly across the surface of most of them lest it end up 20,000 words long. Not many books provide such mental stimulation, and certainly not a single "narrative-led" computer game ever has. People will tell you that games like this are simple thumb candy, fairground reaction-testers deserving only of being condescendingly patronised in grimy little ghetto neighbourhoods of "retro" in the gleaming silver Delta City that is modern gaming. Those people should be drowned at sea in rusted chains. The best philosophy is not that which tells you things, but that which teaches you how to figure things out for yourself. As long as videogames attempt nothing more noble than to feebly mimic other forms they'll never attain such heights, and will never deserve to. Only when they throw off the shackles of such low self-esteem and do the things that they alone can do, can they ever hope to achieve any true cultural worth. My high score is 1,765,262.